Australia is always ranked as one of the most-liveable countries in the world, thanks to our incredible climate, beautiful landscape and amazing selection of sporting activities on offer. Nothing beats getting outdoors and enjoying a day out in the sun with your friends and family. But for the ultimate outdoor activity why not head on down to your nearest Delta Force Paintball Centre. We have what it takes to settle your need for adventure, be it a get together with your mates or to resolve a family feud. Whatever the occasion we’re sure you’ll have an absolute blast on our movie-set game zones. Delta Force offers the most action-packed outdoor adventure for you and your friends. With 10 – 12 movie-set game zones, be transformed from a civilian into a commando and have the most fun you can possibly have on dry land. 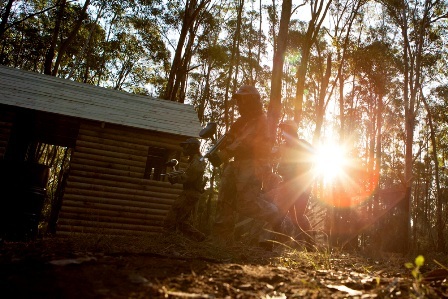 With locations in Sydney, Melbourne and Perth, and an affiliated centre in Brisbane, we are conveniently located no more than an hour from the CBD so there is less travelling time and more thrilling paintball action. Our purpose built paintball centres have been designed for the ultimate paintball adventure. You will have ample opportunities to ambush the opposition, be it behind the giant pyramid, the old mine cart or the bank that is situated in Dodge City. Be sure to use different strategies for each game zone as no two fields play the same. The last thing you want to do is get caught off guard and come under attack from all angles. Picture yourself strategically located behind the London double-decker bus. As you peek through the window you see the enemy advancing forward. You signal your plans to your team and swiftly put them in motion. With cover fire coming from all angles, you move towards the phone box. Do you have what it takes to stop the enemy? This is just one of the action-packed game zones you might encounter on your day out at Delta Force. Combine the zones with our impressive equipment and it’s no wonder why we’re the world’s largest operator of paintball games. Let Delta Force look after your need for an outdoor adventure this weekend. Round up the troops and contact us today on 1300 850 744.